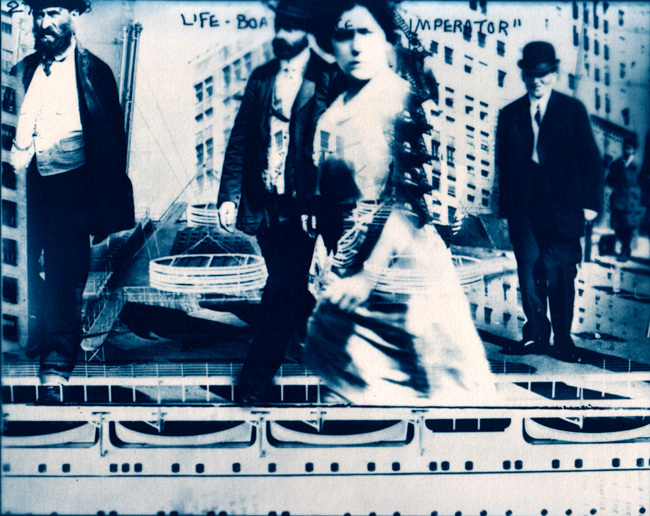 The Library of Congress Remixed is a series of photo collages that synthesize digital imaging processes (searching and manipulation) with Cyanotype, a traditional printing process recognizable by its blue tone. The United States Library of Congress photo archive, made easily searchable on Flickr.com, is remixed in photographic collages where keywords from common English idioms are juxtaposed to form a single visual message. Idioms such as “the sky is the limit,” “a new lease on life (below),” “food for thought,” and so on, are literally broken into keywords and reconstructed visually. The absurdity of the common phrase becomes lucid. The final print is made with cyanotype formula. Invented by Sir John Herschel, Cyanotype is one of the first photographic printing processes.